The local Charity Organization for Children allocate funds for disbursement to eligible individuals or entities under various categories. Accounts Section supervises the disbursement activities. It is part of the responsibility of Accounts Section to ensure that the total value of all payments of a particular category is not exceeding the allocated Amount. As you can see in the above screen; the Budget Amount $10,000/- is allocated to the Poor Children's Education Fund. This Amount will be given away to eligible individuals or deserving institutions. The amount given away after due consideration of the merit of their issues. The payment records are entered into the datasheet sub-form below. Both Forms are linked on the Category Code, which is an AutoNumber Field on the main Table. 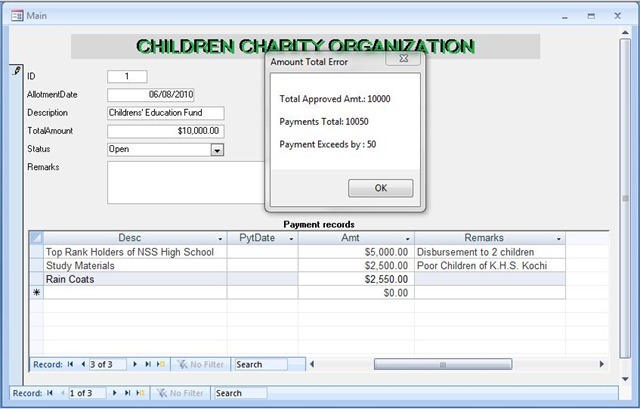 When a new record is entered into the sub-form with the payment value; the total value of all payment records, including the new record, are calculated and cross checked with the budget amount on the main form. If the total of all payment values is not less than or equal to the budget amount then an error message is displayed. The excess value entered is deducted automatically from the current payment value to adjust it and make the total of all payment value equal to the budget amount. The focus is set back to the amount field so that the User can take appropriate action. In the above example the User is not prevented from making modifications to the Budget Amount. But, this field can be locked immediately after creating a new main record with a value. If authorized changes to these records are required at a later period then special access rights can be given to some category of authorized Users. But, this part involves Microsoft Access Security implementation. Leaving that part aside we will take a closer look at the Datasheet Sub-form design and programs, where we have implemented the above procedure. We have created a Text Box at the Footer Section of the Form and written an expression to Sum() the Amount of all Payment records of the current Payment Category, except the current new record. The new record value will not appear in the result of the Sum() Function till the record is saved in the Table. Even though the Text Box that we have created with the expression =Sum(me! 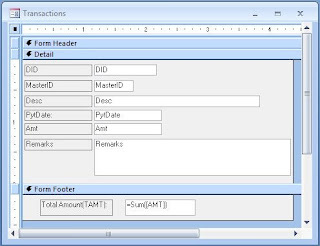 [amt]) in the Footer Section of the Sub-Form, It is not visible in Datasheet view, but we can refer it in Programs. 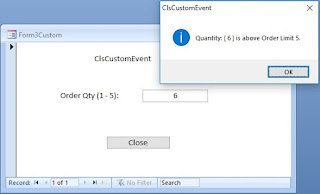 For more tricks with Datasheet Form read the Article: Event Trapping and Summary on Datasheet. The current record value can be read directly from the form field (Me! [Amt]) and add it to the result of the Sum() Function to get the Total Value of all records, including the record not yet saved to the Table. This result can be checked with the Budget control value before the new record value is accepted in the current record. If it is not acceptable then the User is alerted so that corrective action can be initiated. 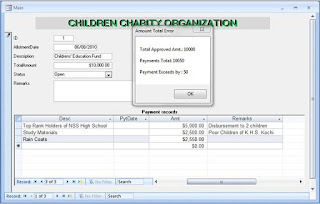 During data entry on the Payment Sub-Form, if the total of all payment value equals to the Budget Amount then the Form will not allow to add more payment records. Exiting Payment records can be edited. When any of the Budget Record on the Main Form become Current it checks whether the total Value of its payments records equal to the Budget Value, if so the Payment Form is locked and will not allow to add more records. But, the existing payment records can be edited. Click the following link to download a Demonstration Database with the above Code. A thoughtful opinion and ideas I will use on my blog. You've obviously spent a lot of time on this. Congratulations! Hi All, I have strange situation which I am struggling with. We have just performed a desktop refresh and at the same time delivered Windows 7 to the new machines. We use SCCM to deliver the machines and the build process works well. However, I have one niggling problem. The first time a user logs on to a freshly built machine the UAC kicks in and prompts for credentials on the Secure Desktop. In our case the UAC is stopping the application of a video card driver. The UAC and Secure Desktop are working as per design as we are making use of this feature. However, I am not expecting the UAC to kick in and stop the device driver installation. This is becuase I have expliclty defined the Video Card Device Setup Class "4d36e968-e325-11ce-bfc1-08002be10318" against the "Allow non-administrators to install drivers for these device setup classes" policy. The one thing I did note is that the certificate used by Microsoft to sign the driver expired on the 23/01/2010. I am not sure is this is the root cause?? I know it is the video card becuase if the Administrator credentials are entered the next event that is viewed is the "Drive finished installing" in the system tray. Can the UAC and this policy work in conjuntion? Has anybody else hit this issue?